Milan 2015: Dutch designers Maarten Baas and Bertjan Pot have combined their distinct styles to create a range of lamps and light-up mirrors for handmade products manufacturer DHPH. Shown in the 5 Vie area of Milan last month, the LEDS Clay collection includes mirrors and a series of lights in different shapes. The designers have been friends for 15 years and regularly share ideas with each other, so decided to work together on a collection that takes elements from both of their previous works. The products are formed from unevenly moulded coloured clay wrapped around steel frames – a material that Baas has worked with for many years. Chunky gem-shaped LED bulbs that Pot has previously used to created carnival-style lighting are embedded into each of the pieces in various arrangements. "Bertjan worked with those funpark-lights before, and obviously I worked with clay before," Baas told Dezeen. "It was just the most obvious choice when we decided to do something together." The mirrors are surrounded by frames made from the clay-covered steel. A tall standing model with a rounded top has three panels, with the side sections angled slightly inwards. The wall-mounted edition has a flat square portion that supports another reflective surface above, which points down to show the top of the user's head. "Bertjan made this angle in the hanging mirror for me to see how much thinner my hair is getting every year," Baas said. Sticking out from the lumpy clay forms, the coloured lights appear to be positioned and angled at random. The lighting follows a similar approach, with desk, floor and circular pendant versions all interspersed with the brightly-coloured bulbs. Although the project was a joint effort, Baas said it is clear to see what each of the pair contributed to the pieces. "If you look at his Downstairs lamp and LED's Go, both produced by DHPH, and you look at my clay furniture, also by DHPH, I think it's obvious what's each input," he explained. The designs are manufactured and distributed by Netherlands-based Den Herder Production House (DHPH), which specialises in making handmade products. DHPH presented the pieces in Milan for the city's design week. 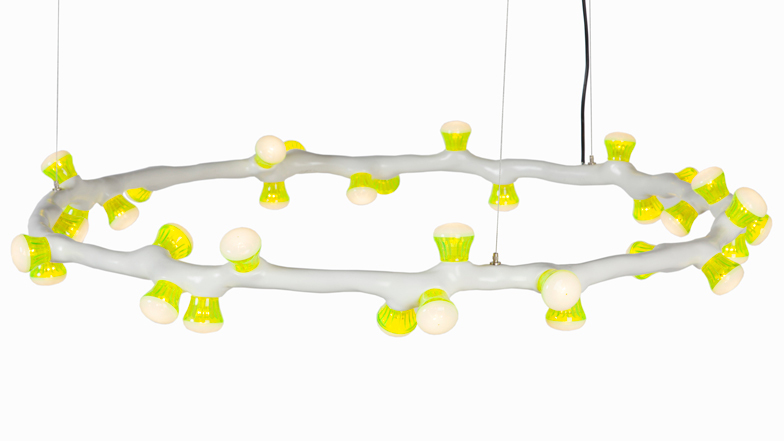 Also during the event, Baas debuted a range of lights for Lasvit, including caps with a similar uneven clay effect, while Pot showed modular versions of his Hercaleum family of lights for Moooi.